Just one of the many wonderful breakfasts we enjoy! So you've decided to travel to Spain, so is it better to take a tour in Spain in Spring, Summer, Autumn or even Winter? This is a really good question. So often I've heard people say that they would like to go on holiday to Spain in summer, July and August in the Northern hemisphere. This is possibly the hottest time to visit Spain as temperatures in some parts soar to over 40°celsius, especially in the interior region of Andalucía. If you are interested in walking or cycling in one of Andalucía's stunning National parks then the best time to travel to Spain, would be in my opinion in May/June and September/October. The Autumn in Spain is slightly warmer than spring. The average temperature in September to October ranges from a low of 14°to a high of 32° celsius. As far as rainfall is concerned March is by far the wettest month. 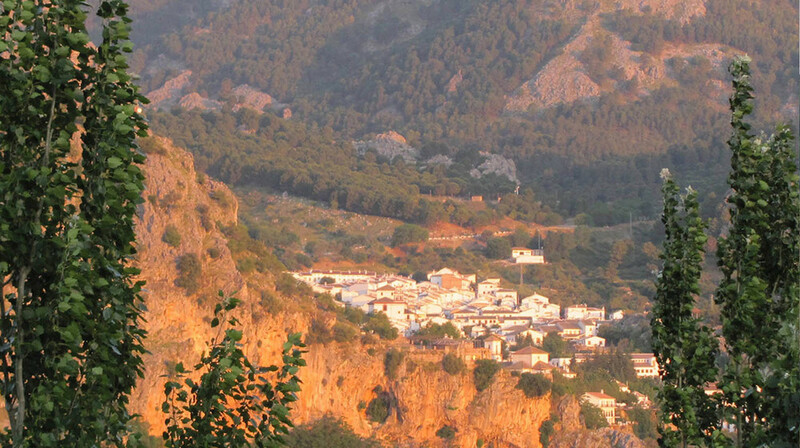 The village of Grazalema has one of the highest rainfalls in Spain, but only briefly and when it does, it rains like 'cats and dogs'. As Spain's climate is mostly dry it's perfect for outdoor activities in Autumn, not to mention the stunning colour change you will see as the landscape becomes a blaze of brilliant yellows and reds. The other thing to bear in mind is the food is fantastic in Autumn. The other time that is less popular is Winter, and even though it is cold, if you are a skier then this could possibly be one way of enjoying a side of Spain that most travellers overlook. The city of Granada is an attraction over the Christmas season and skiing in the Sierra Nevadas is fantastic. Add to this the advantage of cheaper accommodation and Hotel deals - especially Paradors that offer discounted rates in the low season, travelling in Winter could make for a 'White Christmas' like no other and be an extremely memorable holiday. One of the best photo opportunities to be found is the view from St Nicholas looking at the Alhambra with the snow-capped Sierra Nevadas seen in the distance. Again a day trip to the Alpujarras ending with an overnight stay and dinner in Trevelez at La Fragua II, you will be rewarded with one of the best wild game and dining meals you could ask for in Spain. Sign up with your email address to receive special tour offers and free travel tips. Your privacy is of the utmost importance to us. We keep your information in the strictest confidence. Thank you! You will be sent a confirmation email with a link to to confirm your subscription. We promise not to bombard you with emails, we only send our newsletter once a month and you are always free to unsubscribe at any time. Newer PostAre all meals included in small group tours in Spain? Older PostDo you need a reason to slow down?